My guys literally beg for these things–all three of them–Fred, Jamie and Tommy. On busy mornings, when breakfast is a rush, these are their favorite grab-n-go snack. It’s gotten to the point where if I know that everyone has to get out and moving early in the morning, I will make these the day before. We smash two halves together, flat sides facing, and then slip them into sandwich bags so they can be grabbed on the way out the door and eaten in the car. Add a banana or apple, or even a couple of tangerines, and you’ve got a pretty healthy, portable breakfast. The following recipe makes a dozen hard boiled eggs. I almost always double the recipe to make 2-dozen, using a full dozen eggs. The work is about the same and they last longer in the fridge, because there are more of them. My family prefers them made with the added pickle relish. When my oldest son prepares them, he adds sriracha hot sauce or wasabi for an extra bite. 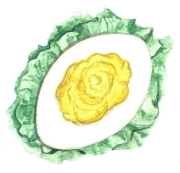 I’ve used both regular and light mayonnaise in this recipe and both make fine deviled eggs. Use the type of mayonnaise that works best for you and your crew. Begin by boiling the eggs according to your preferred method. This is how I do it: Place the eggs in a saucepan and cover with tap water. Bring them to a boil over high heat. Reduce the heat so the water boils gently. Allow the eggs to boil for 10 minutes, no more–no less. Drain well and rinse in cold water until cool enough to handle. When the eggs are cold, peel them. Rinse the peeled eggs to remove any pesky shell bits that may be hiding and slice them in half. Remove the yolks and place them in a small dish. Add the mayo, mustard, (relish) salt and pepper. Mash it all together and beat with a fork until smooth. Use a small spoon to stuff the deviled yolk mixture into the empty cavity of each egg white. Divide the mixture up as evenly as you can. Arrange the eggs on a serving platter and dust generously with paprika. Serve cold. These may be prepared the day before serving if desired. Double, Triple or Quadruple the recipe as necessary. If you make a very large batch then use a whisk or even electric beaters to whip the filling before stuffing it back into the whites. TIP: Older eggs are easier to peel than fresh eggs. Fresh eggs are the ones that shells always wants to stick to. So when you go to boil eggs, choose the ones that have been sitting in the fridge the longest. We usually scrape the filling into a baggie, clip off a corner and “pipe” in the filling, so much easier!